Roaming the internet today, looking for soul sisters in shade-making the world over(of which their are sad few, and the ones I could find are disturbingly Victorian and old fashioned- read:hideous burgundy silk with 4" long fringe trim. BLEH), I did find this amazing little French shop that creates and makes lovely crafts, arts and yes!...abats-jour! 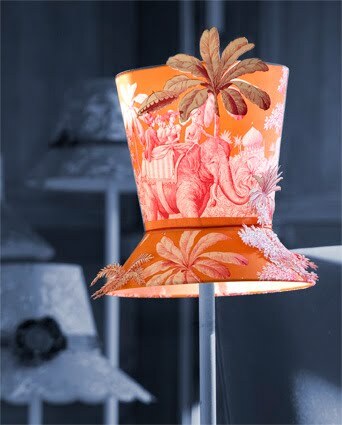 The pictures on the site where inspiring and even though I do not make hat-shaped shades, I adore the fabric selections, humorous interpretations, and flawless craftsman ship of these shades!